I saw an interview the other day with Peter Kreeft. He is a philosophy professor at Boston College and has some great things to say. One part that stood out was that moral relativism has few edges and less of a full experience on how to live life and decide what is right and round. He stated that without defined edges on where things that matter begin and end then nothing matters. 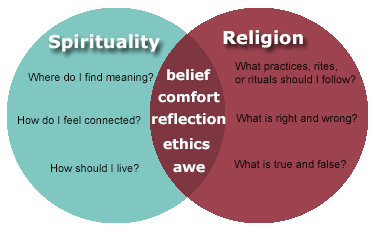 But I thought from there about an even more expanded view of what I call spiritual relativism. The idea that whatever works for your does not have to work for me. But what works for me in giving me a sense of meaning on who I am in my relationships will be defined by the power of my will and guided with my feelings at the moment. There was a touch of that in the book of Judges where chaos was the norm and “everyone did what was right in their own eyes”. In that state, people are full of themselves…or other things. Poor in spirit is an odd wording but we have a clue on where the proper state is for God to do work in us and that is a state of humility or awe of the divine. I recall that scene in Rudy where the hero is torn on whether to go forward in his dream for Notre Dame and asked for a priest’s counsel. He answered awkwardly, “My 35 years of theological studies have taught me two incontrovertible facts: there is a God and I am not Him.” The look of blankness in Rudy Rudiger is comical but when I think about how much I want to adorne myself with pretentions of my own self importance, assumptions of what life is about and such I really need to apply such simple humility too. Another way to think of a good spiritual poverty is in the second verse of the Creation Story “And the earth was formless and void…and then God said…”. Which brings me back to the edges of Peter Kreeft. 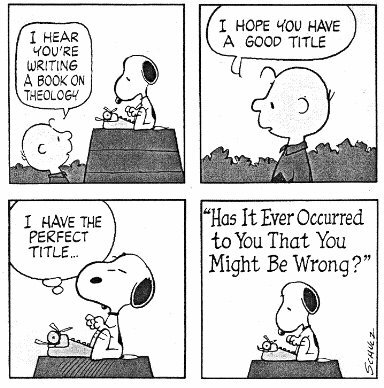 Who sets the edges that define what is meaningful, right and wrong? If there is a King of the universe then it is Him. If he exists, and is personally invested into human beings, then he has a kingdom. And that kingdom would need to be based in a realm beyond our reach or we could easily delude ourselves into watering down moral absolutes in such practical things as the value of the human person based on the whim of the day. Based in a realm beyond our reach, such a kingdom would be not only a standard of “right when we are right, but right when we are wrong” (GK Chesterton). Yes, we enjoy being self-satisfied on what works for us and how we choose it. This is an extension of our individuality. To be poor in that which is distracting is not to say that you have to give up all individuality. To be poor in spirit is to be in a position where your healthy level of individuality is not in resistance to the Creator. Where one is willing to be formed more in conscience morally and awareness of the divine is where true light comes in. But to be filled with grace is where we stop being empty spiritually. We deceive ourselves when we are filled with our own self-importance that is not based in communion with God and the people placed in our paths. Such an attitude is the foundation of sin. But in acknowledging our emptiness we have the other aspect of good poverty, “ If we say that we have no sin, we deceive ourselves, and the truth is not in us. If we confess our sins, he who is faithful and just will forgive us our sins and cleanse us from all unrighteousness” (1 John 1:8-9). But what is it like to stay in a continual place of surrender in what Jesus calls poor in spirit? Think about the teenage girl of Nazareth being told that she would give birth to the Son of God. She is hailed as having been filled in the past tense as full of grace. How she responds accordingly is in saying “Let it be done to me according to your word”. We bump into the words spirituality and religious all the time. The first term is like a feeling to some people and therefore subject to the truth they want to ascribe to that feeling or setting that they are in. Religious seems like structure as an end to itself. If people fall in to either of these definitions there will be emptiness because no one wants to be subject to feelings in the long term and no one wants to be subject to arbitrary rules that just seem mean and to rule over people like mind control. The temptation lies in how people call themselves spiritual but not religious. I disagree because spirituality calls one to ask questions about meaning. Questions have answers if even they are the wrong ones. But under the guise of spirituality, asking questions means that there is such a thing as truth. Spirituality is a pursuit for an answer. Stay true to it beyond comfort level is another things. Take romance without commitment. Take it from your partner? Not so fun. Imagine the love of your life saying after several years, “Well, I was really romantic but I don’t believe in commitment.” The cheater degraded themselves and the one they cheated on. In the same way people that are spiritual but have knowledge of a religion that has the answers, or truths, that are inconvenient area degrading themselves and the Lover of their souls. Often in pop culture (thank Oprah) people are motivated to get warm and fuzzy as we reflect how your truth is not my truth and that is okay. But that only works until truth has consequences. Then the media points to a principle that is universal and above the whims of the day. Even a secular humanist country or media will believe in moral absolutes when they have to. So with what I said above, suppose you give religion a chance? What should it look like? How should it work in your life? As a drug and alcohol counselor, I say, “Whatever works for you. Keep converting to more of what you believe.” I say that because the setting is a pluralistic one and I am not supposed to bring in a proselytizing agenda. Fair enough since my professional discipline is all about self-determination of the client. But if someone is in my faith community, all bets are off. I may occasionally need to serve black coffee (blunt feedback) to someone there. If their “truth” is that God has told my buddy to leave his wife for someone else, I point to the truth of our faith that marriage is for life. Not happy about that? Tough. The holiness objective is higher than your happiness. The frustration on knowing where to find true north of what is right in a world of mostly moral relativism is high. If I were to search for The Truth, where do I start? I propose some fundamentals that guide us to wisdom that ties spirituality and religion together. 1: Truth for the right way to live alone, the world we see, or any existence unseen by nature cannot be quantified primarily in the physical sciences nor senses. What we have left would be the social sciences and secondarily “coincidences” found in the physical sciences but never explicit. 2: The order of the universe happened because of a First Cause, not “just ‘cause”. 3: If that First Cause is a person that has started this universe, which is corrupted, then that First Cause needs to operate at a level of power and existence above that scene or the First Cause would be too great for right existence. 4: If we were to ascertain a way to make this deity known, it would have to begin on the initiative of this Deity, or Higher Power, and not on the initiative of humans. 5: This leads me last to borrowing from the law of thermodynamics call Entropy. It basically states that order decays by nature. So if this is a universal instinct, like in the DNA, and put into some philosophical expectations, then what could be guessed by estimation is that there was for the Greeks a “want-ad” for an Ultimate Someone or Something that could exist. So would that want-ad from the Greeks be answered with a job application? I can think of four. The authors of them were Mateus, Ion Marcus, Lucas and Johanan bar Shebedeh. After a lot of translations on their names, we know them as Matthew, Mark, Luke and John. Sound like too much? Take John. Yes, he was a country boy from the beach town of Gallilee. Yes, he spoke Aramaic and probably knew some Hebrew (he was known among the temple priests). But like a lot of Gallileans, he was fluent in Greek. And he was educated. With that in mind, he wrote, “In the beginning was the Logos (Word). And the Logos was with God and the Logos was God.” He also wrote, “And the Logos became flesh and dwelt among us.” They make the applicant Yeshua ha Nazri. Jesus of Nazareth. But the job application seems to break down if we examine what it means to see Jesus as the Logos. He should not serve us, but He does. Plato also said that if there were to be any altering of this decay in this world, it would have to be done by the Logos. But if Jesus died on the cross, then how could He be the Logos that comes to our world? It makes no sense, unless you interpret the messages of Matthew, Mark, Luke and John as pointing to a Logos with Agape. Unselfish love. But that is another story…. So if Jesus is Truth, and all He said is true, then those words are of consequence. And those words tie together what spirituality leads to in religion. “But religion is all man made!” Yes, but if Jesus is divine and a man, then that is okay to follow what He said. Case in point is a message this mysterious ex-carpenter said on a hill one day in what the religious and secular world call the Sermon On The Mount. It is a dynamic message that is spiritual, points to a set structure of living spiritually and in the physical life and is done with such nuance that it is amazing! I have been Christian for over thirty years and I continue to be a student of Jesus and day by day. Still amazed. Is He worth being looked for, learning from and experienced? With that in mind, I invite the reader to kick the tires in that message. “When Jesus saw the crowds, he went up the mountain; and after he sat down, his disciples came to him. 2 Then he began to speak, and taught them, saying…” (Matthew 5:1-2). When Jesus saw the crowds— If one is to take Jesus, even possibly, as who He is claimed to be by Tradition, then it is incumbent on the searcher to know that you are seen by God and it is His initiative that makes order out of the chaos of our ignorance of truth. he went up the mountain—This is a symbol of the Logos who is above the fray of the daily life. So he goes to higher ground and the crowd that wants to hear truth go there. Moses did this 1200 years before when he declared the Ten Commandments. and after he sat down—But does He have authority in what He says? Is Jesus worthy of being called a rabbi let along the Ultimate Truth? To sit down and teach was the posture of a Jewish rabbi who would teach the Law. As the wisdom in this message unfolds, the reader can test out those words for application. But the more those words permeate our hearts, the more we are tested but with an invitation to come and see more. And if we see more, then we can receive more. What is stopping us?